Melitzanosalata, also known as Greek Eggplant Dip, is a healthy, and hearty recipe perfect for vegans and vegetarians. Baked aubergine is mixed with garlic, olive oil, lemon juice, tahini and herbs than slathered on fresh bread, or served as part of a Greek meze feast! Melitzanosalata – pronounced meh-leed-zah-no-sah-lah-tah – is a delicious, traditional Greek eggplant dip. Aubergine recipes can be found throughout the Mediterranean and trace back to ancient times. Outside of Greece, you’ll find Middle Eastern eggplant recipes are popular in places like Turkey, Jordan, Egypt, Israel, Morocco and Spain. 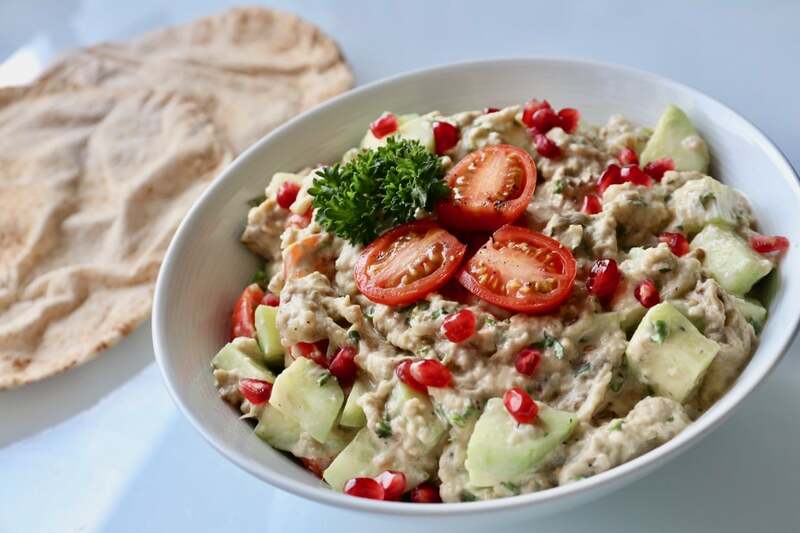 The world’s most famous eggplant dip is Baba Ghanoush, which food historians believe originated in Syria. 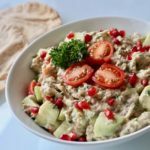 While Baba Ghanoush may have a more recognizable name, study various recipes from the Levant and you’ll find they’re almost identical to Greek Melitzanosalata. Perfectly baked aubergine fresh out of the oven ready to be sliced and scooped. 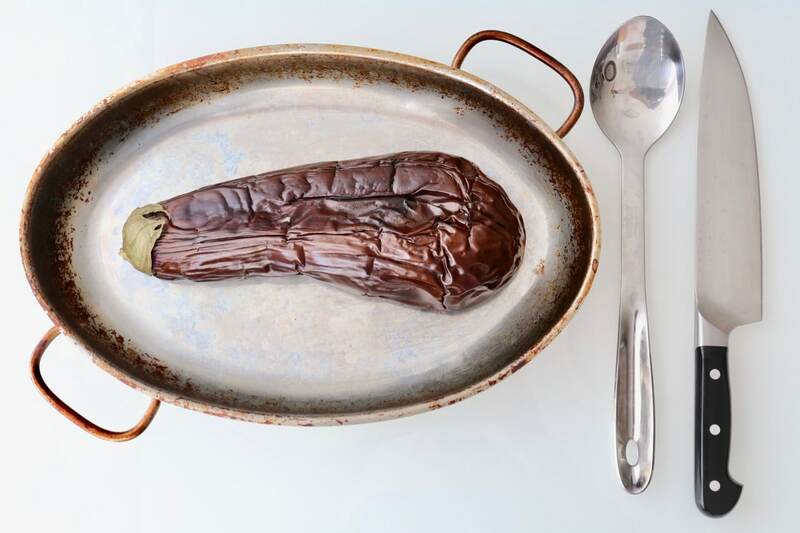 Roasting or baking an aubergine is very easy. We’ve detailed the process in our recipe below but it’s best to familiarize yourself with the steps before getting set up in the kitchen. Line a baking sheet with parchment paper or lightly grease. This ensures the roasted aubergine skin does not stick or rip in the oven. Pierce the eggplant skin with the tines of a fork in several places to allow steam to escape. This prevents the roasted aubergine from exploding or bursting apart in the oven. Roast in the oven for 35-45 minutes. Remove from oven, and let cool. Slice eggplant open and scoop out the flesh into a colander in your sink. Leave roasted aubergine to drain for 30 minutes. Eggplants have a high moisture content so you want as much water to drain off as possible so your dip is not runny. You can start to prepare the Melitzanosalata as soon as your strained roasted aubergine has cooled. 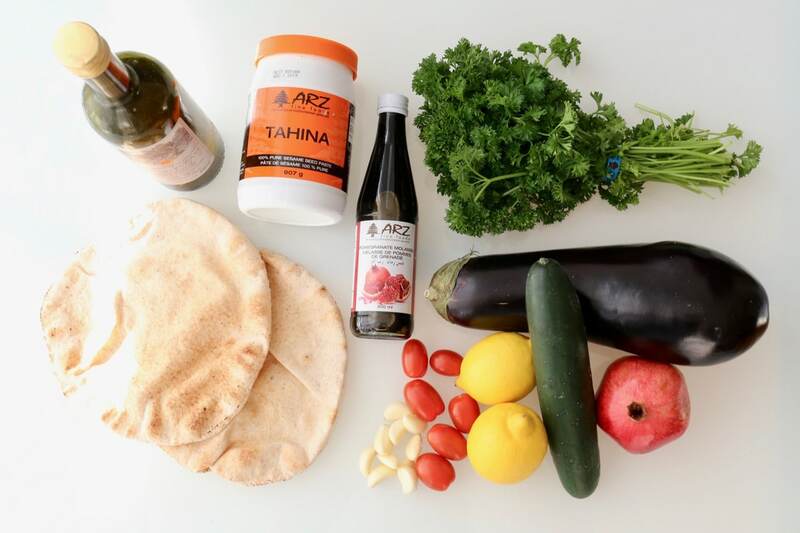 You’ll need a medium sized bowl, measuring cup and knife to prepare our Greek Eggplant Dip so be sure you’ve got all the necessary tools ready in your kitchen. Follow the recipe below step by step and in just a few minutes you’ll have a gorgeous Melitzanosalata to show off to your guests! Melitzanosalata Greek Eggplant Dip served with pita. Melitzanosalata is a fantastic recipe for vegetarians and vegans as roasted aubergine offers a hearty and meatless main. Greek Eggplant Dip is most commonly served as one of several meze (small plates) during a family feast. Here are some great serving suggestions for Melitzanosalata lovers. Bread: slather over crunchy slices of sourdough or use fresh pita to dip and delight. Breakfast: scoop Greek Eggplant Dip onto a plate in the morning and top with an oozing poached egg and fresh herbs. Meze Potluck Party: host a Greek meze potluck party where each of your guests brings their favourite Middle Eastern or Greek dip/salad to share. Superbowl Snack: skip the high fat and salty chips and dip and offer up a healthy bowl of Melitzanosalata instead. If you’ve got access to a grill or open flame, scorch the eggplant rather than baking it in the oven. This is how Greek Eggplant Dip is traditionally made and adds a nice smokey flavour. Sprinkle with crumbled feta if you’re a cheese fan. Swap out parsley for other fresh herbs you may have in your garden such as dill. Melitzanosalata Greek Eggplant Dip is a healthy recipe perfect for vegans and vegetarians. Serve slathered on fresh bread or as part of a Greek meze feast. Preheat oven to 400F. Line a baking sheet with parchment paper or lightly grease. Pierce the eggplant skin with the tines of a fork in several places to allow steam to escape. Roast in the oven for 35-45 minutes. Remove from oven, and let cool. Slice eggplant open and scoop out the flesh into a colander in your sink. Leave to drain for 30 minutes. Chop eggplant flesh and transfer to a large mixing bowl. Add tahini, water, pomegranate molasses, lemon juice, garlic, parsley, and salt and pepper. Mix well with a whisk then taste and adjust for seasoning. Slice the cucumbers into thin coins and slice cherry tomatoes in half. Stir cucumber and tomatoes into the eggplant mix. 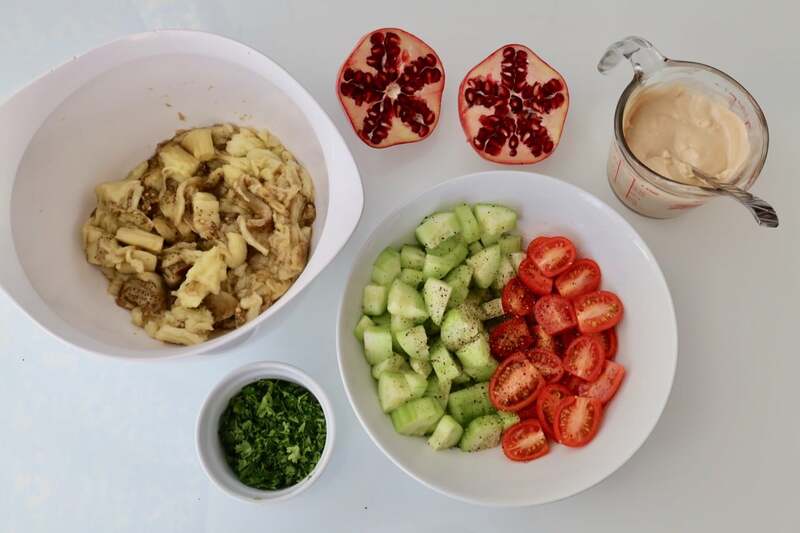 To serve, spread in a shallow bowl scatter with pomegranate seeds and drizzle with olive oil.